“More than seven thousands Yemenis were killed this year  which means three levels of the number killed in 2011 when the youth took to streets in a peaceful revolution against the regime of Ali Abdullah Saleh,” the report said. The report said that the Yemeni military alone lost in 2014 over than 1,000 persons, 600 of them were killed by the Houthis while they were attacking military camps and taking over provinces. The other 400 were killed by Al-Qaeda and other armed groups often in assassination operations, blasts and surprised attacks against military camps and checkpoints. Around 1,200 civilians were also killed in 2014, most of them lost their lives during attacks waged by armed violent groups since the National Dialogue Conference (NDC) concluded on Jan 25 2014. The report also shed light on the loss of the Al-Qaeda which is estimated between 400 to 500 militants. Around 106 of the Al-Qaeda dead militants were killed during 26 US drone strikes which also caused the death of six civilians among them three children. “No accurate information on the casualty of the Houthis and the Abaad Center estimates that about 5,000Houthi militants were killed, 2,000 of them were killed in Marib, Al-Jawf, Amran, similar number of the Houthis was killed in the capital Sanaá and other cities such as Hodeida and Ibb and about 1,000 Houthis were killed during the fighting in Radaá of Al-Baida,” the report said. The report expected that the Houthis will continue their attacks against the oil eastern areas of Yemen to take control of Marib and Al-Jawf under the pretext of protecting the state’s establishments and camps and pursuing saboteurs and terrorists. The state military and its warplanes are expected to be used this time to attack these areas because the army was defeated in three wars with the tribesmen of those areas between 2011-2014. 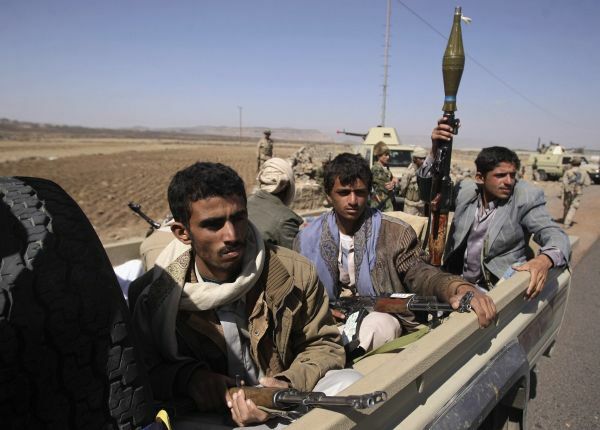 The report said that the military personnel feel humiliated as a result of the Houthis ‘control. It said that the Houthis obtained advanced weapons when they controlled the headquarters of the six military command (headquarters of the former first armored division) and its affiliated camps including the 310 brigade in Amran, the central command of the defense ministry and the military staff. “The Houthis have now more than 120 tanks (T55-T62), about 70 armored vehicles (BTR-BMB), 20 artilleries (self-propelled artillery piece and shilka), 10 vehicles for Katyusha multiple rocket launchers, about 100 missiles (air to air and BM-21 Grad) and over 100 armored vehicles capably of carrying heavy and medium machineguns and other hundreds of military cars and dozens of ammunition stores. The Houthis probably obtained shipments of Iranian-made missiles and other ships of weapons sent to them from Tahran. In addition to all that, the Houthis are controlling 70 % of the Yemeni military and besieging other camps containing highly strategic weapons such as long-range missiles and they are in control of military airports. “There is no more national army after September 21st 2014 and all national army brigades that were exhausted by the six rounds of wars with the Houthis were taken over by the Houthis after the Houthis took over the central command of the defense ministry in the capital Sanaá and some brigades that are still not under their control are under blockade and not allowed to move anywhere, “the report said. The former president Ali Abdullah Saleh established in mid 1990s a parallel army to the national military. The report said that this parallel army has dozens of brigades in different governorates mainly the military camps surrounding the capital Sana’á. These units were trained and militarized in line with plans supervised by professional Arab and western officers. These units were not engaged in any war of attrition with the Houthis and only took part in short intervention when the Houthis advanced into BaniHushaih area, nearby the capital Sanaá during the six round of the war with the Houthis between 2004-2010. “But, the war they [Republican Guard Units] had with the 2011pro-revolution tribes in several areas mainly in Arhab and Al-Hasaba created a spirit of revenge and hostility among commanders of these units, so they kept obstructing transition and military restructure, however this was not the key reason for those commanders to support the Houthis to retaliate from the youth revolution,” the report said. “The way that Hadi used with these forces as a property for the former president highly damaged capabilities of these units. He [Hadi] deliberately disassociated some of these units, marginalized its commanders, and reduced its financial resources which they used to enjoy while run by the son of former president brigadier general Ahmed Ali Abdullah Saleh,”the report explained. “The president Hadi had also created personal loyalty for himself at these units a thing which made these units more scattered, distant from the loyalty of the national army and under multiple polarization by the Houthis, Hadi and Saleh,”the report said. The report stressed that the President Hadi failed to lead the peaceful transition despite unlimited solidarity and support provided by the Yemeni people, the region and the international community. This is due to the weak character of the president and his reluctance to take decisions and has no national vision or social experience in dealing with the tribal community that deliberately marginalized in his first days of rule and his refusal to represent the tribe in the NDC. Hadi also was busy with conflicts and polarizations with the former president inside the GPC and the state institutions, a thing which created a sheltering environment for political coalitions that put its hand with armed groups to topple what was left of the state symbols. “The main reasons that hastened the Houthis’ control over the state is the economic failure in achieving minimum requirements of living for Yemeni citizens, the shortage of service in electricity, water, health, education and the weak military and security response to the expansion of conflicts and mutiny,” the report said.